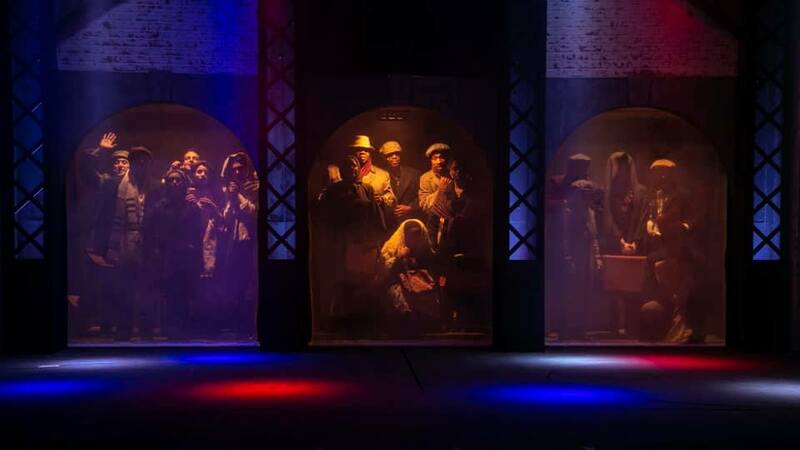 I’ve said it before and I’ll say it again, The Eagle Theatre in Hammonton, NJ puts on remarkable, revolutionary, and inventive productions repeatedly season after season. Just like the Arden Theatre in the heart of Old City, The Eagle Theatre (a brisk ride over the Walt Whitman) builds every production around the story they elect to tell. They build from the ground up. Ragtime, now playing through February 17th, is a prime example. A small, intimate space, mounting such a mammoth of a musical like Ragtime. For any avid theatre fan, you wonder, “How in the hell are they going to pull this off?”. That is the mere reason why three pals were eager to tag along with me to see THIS production. I told them that the musical was being performed by 20 people (actually 18) when the original Broadway production had a cast of 50! Research indicates there are two versions of licensing which assists in the downsizing of cast. Written by Ahrens and Flaherty (Once on This Island, Seussical) which was derived from a novel written by E.L. Doctrow, Ragtime is just as compelling today as it was in it’s turn of the 20th century. Watching this story come to life, in today’s political climate, had me sitting with my mouth open, leaning forward, gasping at times, and swaying at others for two continuous hours. Wealthy white family, an immigrant Jewish man and his daughter, and an African American affluent musician of ragtime. Director/Producing Artistic Director Ted Wioncek III warned us that Ragtime was The Eagle’s biggest production to date. But his enthusiasm for the project along with the sold-out house, made the night electric from the jump. The opening number, “Ragtime”, as sung by the entire company, delivered the goods on so many levels that I found it hard to contain myself. The set, as designed by Don Swenson, used much of the technology seen in previous Eagle productions. Most notably, three archways upstage that have electronically run shades which worked in tandem with lighting as designed by Chris Miller. This allowed for entrances, exits, silhouettes (which tied magnificently into one plotline), as well as changes for scenery and location. There was also three second level playing spaces with one being center stage that allowed for several tricks. Shout out to the stage management team, led by Rick Trovato for the constant movement of props, scenery, and special effects that were expertly choreographed. As learned from the curtain call, the actors that compile this magnificent production hale from all over the USA. Making this production a mini melting pot of its own. It’s no wonder that Kimberly Suskind (Little Women, John & Jen), an Eagle Theatre all-star, leads the cast as Mother. Her stoic portrayal gave hope and balance against the anger inducing character of Father so distinctively played by Brian Michael Henry. Playing her Younger Brother, Adam Hoyak, another Eagle veteran (Catch Me If You Can, John & Jen), takes what many frustrated liberal Americans are feeling and vocally explodes all over the stage. Colin Rivell’s Little Boy was a charming delight. Jewish immigrant’s Tateh and his Little Girl are realistically played by Spencer Rowe and Annabelle Corigliano. Proving that hard work, good ethics, and trust can build the American Dream. The vocal power punches were delivered in tandem by Cecilia Snow as Sarah and Ezekiel Andrew as Coalhouse Walker Jr. Although Snow didn’t seem to connect with the role, she pummels us with her magnetic voice during “Your Daddy’s Son.” But this production is owned by Andrew. His charm, his piercing eyes, his synergy to the character engulfed us all in Coalhouse’s plight. With a background in opera and musical theatre, it comes at no surprise that his voice leaves an imprint and takes us on a ride with “The Wheels of a Dream” and “Coalhouse’s Soliloquy”. For any history buff, the ensemble brings you the likes of Harry Houdini (Will Stephan Connell), Emma Goldman (Hanna Gaffney), Henry Ford (Luke Bradt), Evelyn Nesbit (Patti-Lee Meringo), and Booker T. Washington (Darryl Thompson Jr.) to name a few. The incredible ensemble was worked to the bone in this production. They ALL played multiple characters, even genders, to move forward the momentum. Even the principals participated as ensemble throughout. I can’t even begin to imagine subbing in their track. Even though there were only 18 actors playing 50 roles, that didn’t mean their costumes were any less. Designers dubbed “Team Eagle”, at times too clean for the working class, the turn of the century design was exquisite. Every fiber was planned and well executed, and the quick changes are something to marvel. Ragtime was vocally astounding (Jason Neri-Vocal Director), cleverly staged (Nicole Calabrese-choreographer), and luxuriously costumed. There wasn’t a powerhouse number that wasn’t being applauded before it came to its pivotal end. Ted Wioncek III continues to deliver polished, innovative, and clever productions time and time again. On top of that, he is kind and generous to his patrons and so is the staff at The Eagle Theatre. If you haven’t purchased your tickets already, I suggest doing so TODAY. Performances are selling out! Do yourself a favor and take a look inside Philly Theatre Week for some discounts!